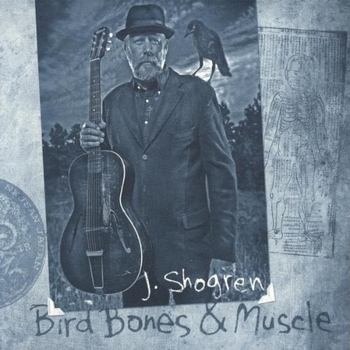 Last year, I reviewed J Shogren’s last album, American Holly, and I talked about his wild imagination. More recently, I kicked off my Americana Festival with Jalan Crossland‘s latest album. I found Crossland in the first place because J Shogren told me they were working together. Bird Bones & Muscle is the result of that partnership. To me, the album feels like two very talented musicians feeling their way until they found what works for them as musical partners. Bird Bones and Muscle begins as a rock record. Burnt Fields begins with a figure on electric guitar, and soon the whole band tears into this blues tinged number. It sounds some what like the heartland rock of John Mellencamp, around the time of the Scarecrow album. But wait, one of those electric guitars sounds odd… That’s a banjo! Yes it is, and Crossland gets it to do some things I’ve never heard before. Blues and rock banjo are new to me, but they work. Three more up tempo rockers follow, and the last of these, Loving Time, is also the weakest. The lyric is skeletal, and the song sounds like a band rocking just to rock. There’s not really anything wrong with that, but American Holly led me to expect more here. And then the next song started, and I got more. Big Blue Bird of Happiness is the first ballad on the album. The lyrics present unrequited love in an original way, and the music has subtle touches that add to its beauty. From here on, we are in good hands. Paper Barn is a declaration of love that promises that dreaming together can make it true. The song has a spare arrangement that does everything it needs to with just acoustic guitar and a few elements for flavor. My Remedy is another declaration of love, this set to a slinky blues groove. Later, there is Polkagris, an actual polka, where Shogren’s sense of humor sneaks out for a moment. This one sounds like it was a blast to record, which also makes it a treat for the listener. And there are two songs, Wandering Foot, and Judge & the Hangman, which are ballads in the old sense that they tell stories. Wandering Foot is the tale of a man who sacrificed his family for an ill-advised affair, and had cause to regret it. This may be Shogren’s most emotional vocal on the album, and the song is totally convincing as a result. Judge & the Hangman is a powerful evocation of the Old West, something Shogren does very well indeed. I mentioned the four rockers that start the album. Each has its merits, but I found the block of them a bit much. Indeed, there are more up tempo numbers as the album progresses, and they sound better. So I think it might have sufficed to sequence the album differently. On their own, I can certainly recommend Charlie Poole, Charlie Poole and Salvation especially. So I don’t know if Shogren and Crossland intend to continue working together, but I would like to hear the results if they do. In any case, I hope to have for you whatever each of them chooses to do next. One more quibble if I may: there is a female vocalist on Bird Bones and Muscle, who adds some wonderful harmony, and whose work really makes a difference on several songs. J Shogren only lists his musicians by first initial and last name, so I don’t know who she is. If I find out, I will let you know. Update: I heard back from J Shogren, and he tells me that the background singer is Mandy Bohlender. She is in a band called The Free Range Band; I don't believe that they have recorded anything for release yet, and when they do, they will need a name change. There is already another band out there by that name.